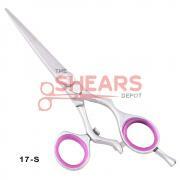 Interested in buying bulk quantities of hair shears to re-sell? Please Contact Us for bulk quantity hair shear prices. Special!!! 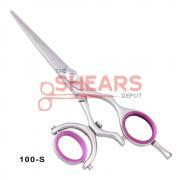 Call us to buy any 3 Shears for $100 with Free Shipping! Order via Phone. 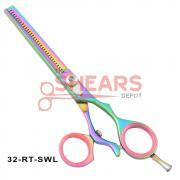 Description: Excellent quality 440C Japan Steel 3 Ring Double Swivel Rainbow finish hair cutting shears. Being offered at a great price here! 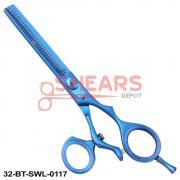 Description: An excellent hair cutting shear for a professional stylist. 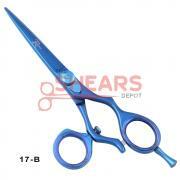 Available in a beautiful blue color finish at an amazing low price at The Shears Depot warehouse! 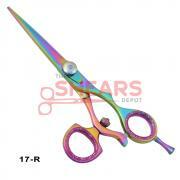 Description: High grade 440C stainless Steel hair shears. Lifetime Warranty. Free Shipping! Free Leather case! Free finger inserts! Description: High quality Japan Steel 440C hair cutting shear with double swivel thumb. Available to you at a wholesale price! Description: 3 Ring Swivel Mirror polish finish. Excellent quality 440C stainless steel of very high grade. Professional hair cutting scissor. Free shipping! 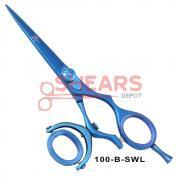 Description: 3 Ring swivel shears with blue titanium finish. High grade 440C stainless steel for professional use. Free shipping! Description: 3 Ring Swivel Rainbow multicolor titanium finish. Excellent quality 440C stainless steel of very high grade. Professional hair cutting scissor. Free shipping! 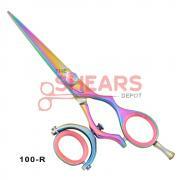 Description: Rainbow finish Swivel hair scissor. Made of 440C Japan Steel. Free shipping! Free case! Free inserts! Description: High quality 440C stainless steel swivel hair shears. Give extra comfort to the hair stylist. Free shipping! Free leather case! Free finger inserts!